As kids get ready for the back-to-school craze, they will soon be flooding the halls exchanging highlights of their summer. And those children with cancer or blood disorders—they are kids too! Going to a summer camp is an experience unlike any other—time away from home, new friends and amazing memories. For children burdened with routine cancer therapy, summer camp may just feel like a dream. To help make these dreams reality, McLane Children’s Scott & White helps children with cancer and blood disorders attend a summer camp that is perfectly suited for them, called Camp Dreamcatcher. The growth of the camp has been tremendous, from just over 20 participants in its first year in 1999, to now more than 100, with many former campers now serving as camp counselors. Jenny Damron, McLane Children’s child life specialist and camp director of Camp Dreamcatcher says she’s committed to this camp because it changes lives. 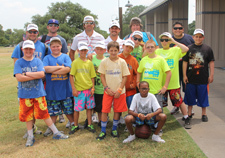 Most children who attend camp are from the Central Texas region and all treated at McLane Children’s. In the world of pediatric cancer, they are often forced to grow up quickly and aren’t able to focus on the things that other children their ages get to do. “At camp, we focus on fun and letting them be normal kids,” says Ms. Damron. The emphasis at Camp Dreamcatcher is on what the children can do and not what they can’t do because of their illness. “At camp, their days are full of activities which naturally build self-esteem and confidence,” says Damron. At Camp Dreamcatcher, children can do activities that they’ve never done before and feel accomplished when they do them. The campsite has two large lakes, lodges, ropes courses, swimming, fishing, archery, sports, horseback riding, and much more for the children to explore. All activities are supervised by counselors and medical staff is on-site to help them face challenges with confidence. At Camp Dreamcatcher, the participants can see other kids who are in even more difficult situations overcoming obstacles. Ms. Damron says this can help to foster new friendships and create another support system. When the child returns for treatment, he can fight back with even more determination. Children who have participated in the camp also say it is awesome to interact with their medical staff in a different setting. The staff is trained to work with children with all degrees of illness and some counselors are even cancer survivors themselves. Ms. Damron adds that many campers say this is the best week of their lives. A time away from their worries, and a week they will always remember. As a child life specialist in the hospital setting, Ms. Damron provides education, emotional help, support for siblings, opportunities for play and expressive activities, and relationship building. All of these experiences are even better at Camp Dreamcatcher. Visit our website for more information about child life services or Camp Dreamcatcher. (View all the photos here).